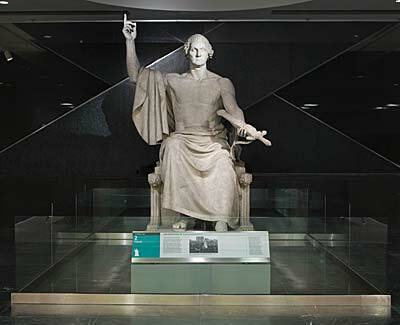 In 1832 the U.S. Congress commissioned sculptor Horatio Greenough to create a statue of George Washington on the occasion of the centennial of the first president’s birthday. Installed in the Capitol Rotunda after its completion, Greenough envisioned the statue to be a symbolic representation of Washington as a great exemplar of liberty. Greenough’s sculpture is enriched with symbols: Washington’s figure is modeled on the classic statuary of ancient Greece, seat of the world’s first democracy. Carvings on the sides depict the Greek god Apollo and an infant Hercules. Small flanking figures of an American Indian and Christopher Columbus represent the New and Old Worlds. The most important symbol, however, is the sword in Washington’s outstretched hand: this celebrates the fact that after he led the country to victory in the American Revolution, he selflessly relinquished his power to the people. The statue was on display in the Capitol Rotunda from 1841 to 1843 when it was relocated to the east lawn. In 1908 Congress transferred the statue to the Smithsonian Institution where it was exhibited in the Smithsonian Castle until its relocation to the new National Museum of American History in 1964. It has resided on the second floor of the Museum ever since.